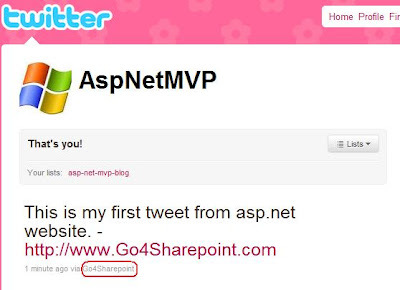 Twitter Tweet Posting from Asp.net Web Application using OAuth. Now, lets understand each steps in more details, step by step. 2) Login to twitter and Fill the Application Information as follow. - Choose Image for your Twitter Application. 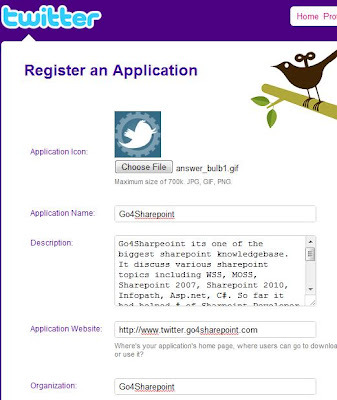 - Fill in Twitter Application Name. 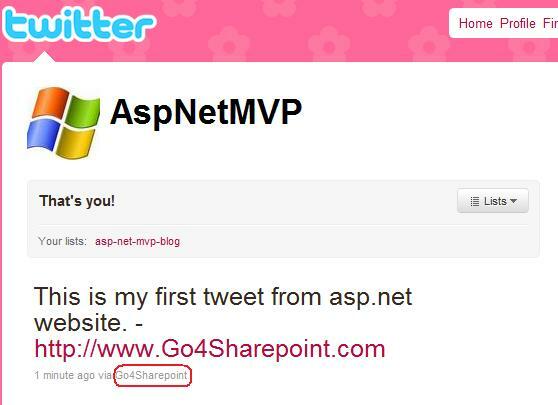 - Choose Application Type as "Browser" as we are developing asp.net website to post tweet. 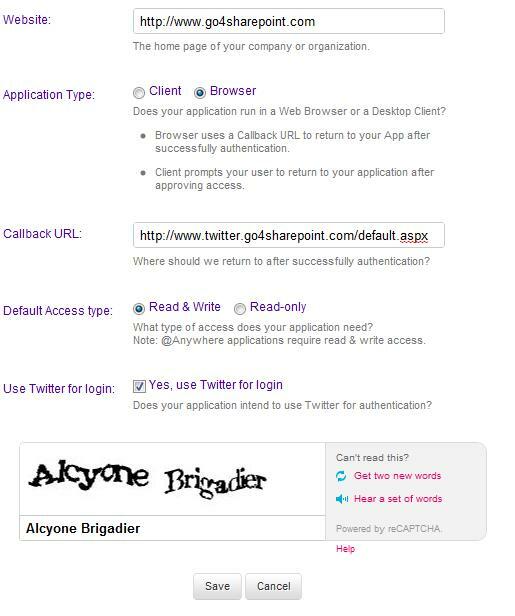 - Callback Url is url where twitter would redirect after authentication. 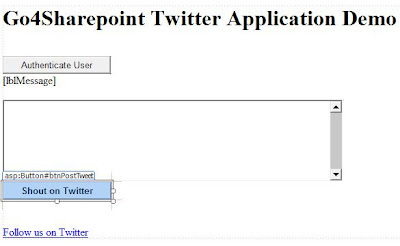 - Fill in rest of details as shown in figure and your Twitter Application is ready to use. 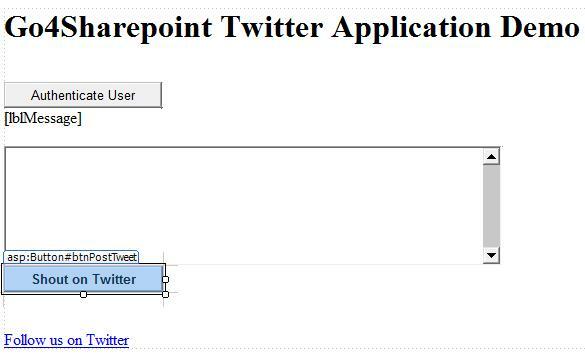 Now, lets begin the important part, how to post tweet. 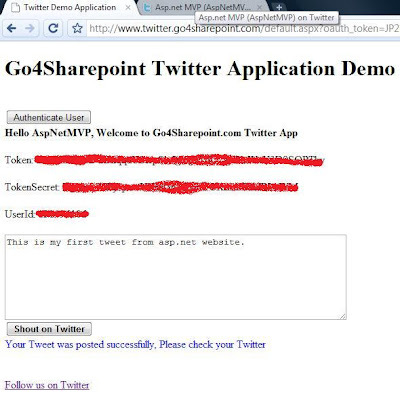 4) Copy Consumer Key and Consumer Secret generated from Twitter Application. 6) In .aspx page arrange the controls as shown in figure. 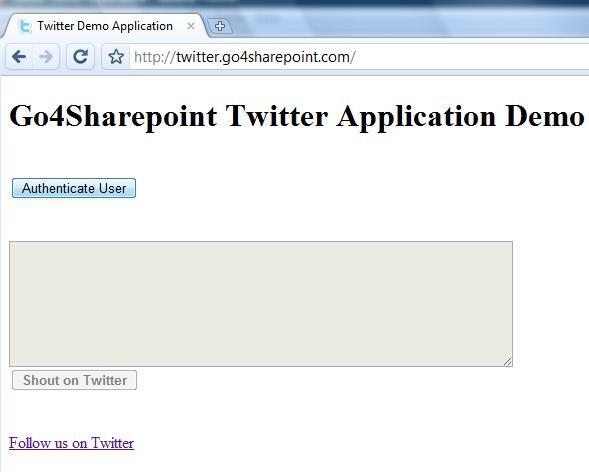 8) Now run the application and try to click on "Authenticate User" button, it will redirect you to twitter website authenticate user and return back to your asp.net website. Click on Authenticate User button. 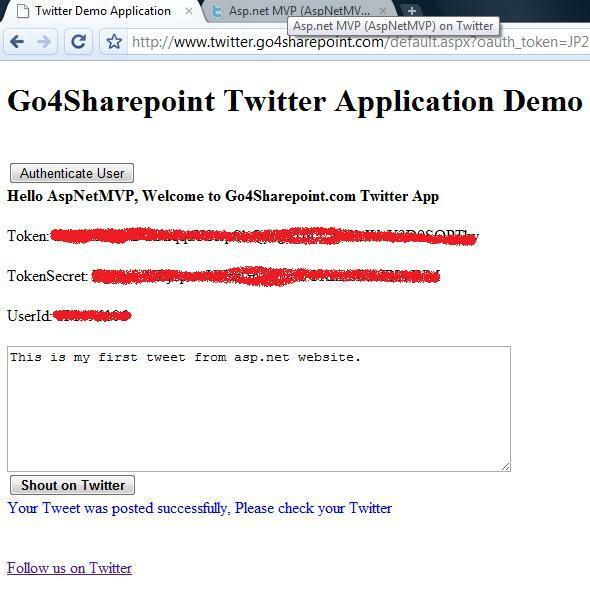 9) Create OAuthToken Object and Post Tweet. also if after one time authentication does tokens expires..? It is not possible to avoid allow/deny screen, but you can avoid reauthenticating by storing authentication infomation in DB to access again. How do you get the lblMessage to show up? When i create a label and then authenticate it does not work. Do you have to have the btnpostMessage_Click method under the Page_Load method? 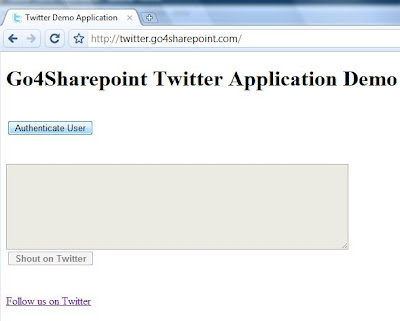 Is there any possibility to release the hidden codes available in the Twitterizer dll. Hi, I'm trying to follow your step by step. But the method "GetAccessToken(consumerKey, consumerSecret, oauthToken);" seems different now. Another parameter is asked "verifier". So we need to get a pin number, and this is my problem, I don't have any idea about how to get this pin. Do you have an advice about? 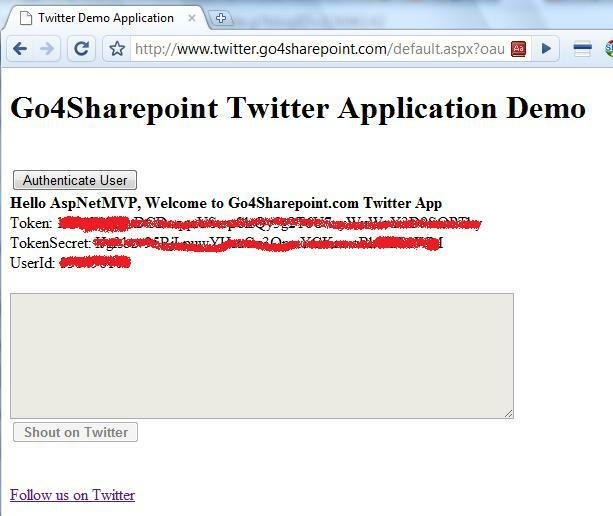 i implemented same code in my asp .net web page but after authentication screen its not redirecting to my web page .its redirecting to my callback url page.. Please provide latest code. Your live demo works but code shown here is old and doesn't work. After I click allow , a pin code is generated, how do I get red of this? I'm trying to follow your step by step. But the method "GetAccessToken(consumerKey, consumerSecret, oauthToken);"
you have same stupid problem in your solution as i do in mine..
when the user is authenticated and your app gets the token back from the Service provider, you can store it in a db.. so that you can sign the request by this access token next time and avoid giving allow / deny screen again..
but how would you know a given user has visited your site earlier in order to get his/ her access token back from your db? 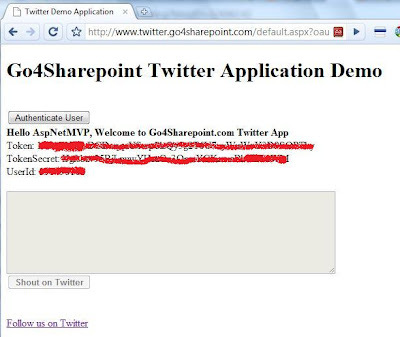 i cant see a single person talking about it and everyone is just doing a lame half legged dance for oauth.. This blog post is way old and lot of things have changed, its my mistake that i haven't got chance to update, but i will do that shortly. If you want to store that user registration for your site, you can add a field call Registration Type to your UserInfo Table, wherein you can maintain detail about login from Twitter/FB/Linkedin or through your native registration process. 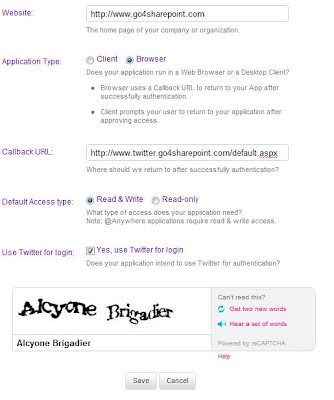 If user is registered using Twitter and if you are unable to find oauth information in your UserInfo Table, that means user is login for first time with twitter, then you can redirect user to your custom registration, wherein you can take information for your site and that way user can login with those credential, but if user choose to login using twitter he has go through oauth procedure. If you want to do auto-login when user visit next time, then cookie is the answer. Now it is upto you how wisely you store the cookies info. I hope you may see some light at end of tunnel. 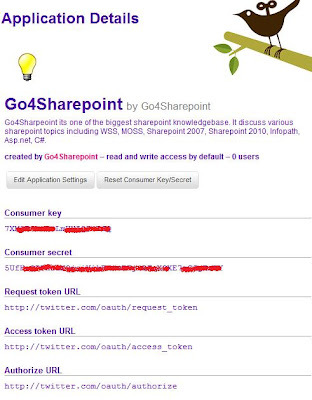 @dotnetguts, thanks for your post, i appreciate.. i guess the choice is going to be to find a way to query Service Provider for the token of logged on user using my consumer key..
lets see gotta work on this tonight..
how to get oauth_token which is pass in query string . Error 2: No overload for method 'GetAccessToken' takes 3 arguments..